Here’s the easiest way to adjust brightness and contrast (in Elements anyway; you can use similar methods in most photo editing applications): Choose the Enhance → Adjust Lighting → Brightness/Contrast command to get started. The controls are simple to use. Raise them to increase brightness and contrast. Lower the controls to decrease. The contrast was set first and then brightness control was adjusted to balance everything. Both settings have been raised to brighten and strengthen this photo. Levels is a step up from using brightness and contrast. It has more controls to master and a histogram to deal with, but the results you can get from the Levels setting are usually worth the extra effort. Levels has improved the brightness and contrast. Don’t let the histogram scare you when you’re adjusting Levels. The histogram shows the distribution of brightness in the photo and helps you see the effects of your actions. If you want, ignore it and just look at your photo. Choose Enhance → Adjust Lighting → Levels to begin. 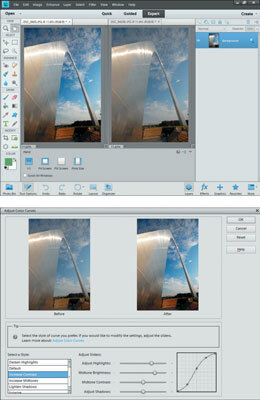 To lighten an image, drag the white triangle under the main histogram (the graph) to the left, as shown. To darken an image, drag the black triangle to the right. Drag the gray triangle to move midtones (areas that aren’t very dark or light) up or down. Note how this gives more detail in the bright metal of the plane. Shadows and Highlights is another brightness and contrast tool. Use it to selectively brighten shadows and simultaneously bring highlights under control. This feature is often immensely helpful. This shot has been edited to brighten the shadows under the chin of this statue as well as darkening the sky a bit. Lighten Shadows is a good tool to have if your shadows are a bit dark. Darken Highlights is also a good tool, but for the reverse reason. Midtone Contrast controls contrast (but only midtones). Despite being on the Adjust Colors menu, Curves is a helpful way to alter brightness and contrast. 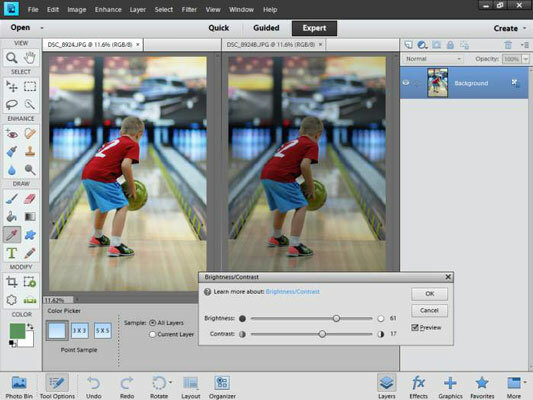 Curves has a simplified interface in Photoshop Elements (compared to other programs such as Photoshop or PaintShop Photo Pro). Curves has presets and sliders, whereas the other programs let you plunk points on the curve and move them around. A suggestion for working with Curves: First, choose different styles (such as Increase Contrast) and then tweak the sliders to achieve the final effect.